The SUF Lodge #1 in Heart's Content was built by the original Society of United Fishermen, a society founded in 1862 by Rev. George Gardener, a Church of England clergyman. 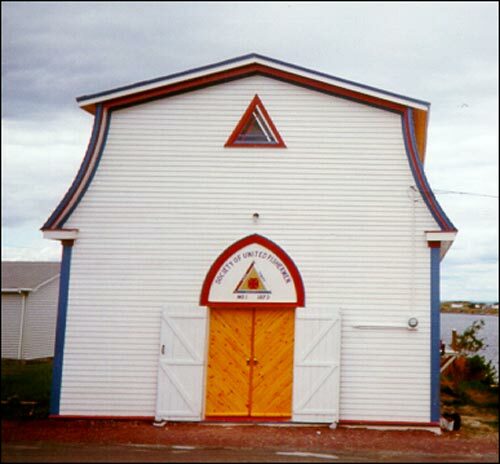 Society of United Fishermen Lodge #1 is a good example of an early lodge structure in outport Newfoundland. In 1868 Gardner designed the structure and members of the fraternal association worked on the construction. By January 1869, they had finished enough of the building to hold their annual meeting there. Other locals adopted the basic design of the building as the association spread throughout Newfoundland and into Nova Scotia. The one-storeyed structure had a gabled roof with decorative verge board and neo-Gothic windows in the entrance. The main room has a balcony and grooved ceiling shaped to resemble an upturned boat. Attached to the main chamber is a vestibule. The structure also had a "bread loft," which has since been closed. The end wall has a triangular window that represents the symbol of the society. The triangular shape was chosen to represent Newfoundland's approximate shape, with Cape Bauld, Cape Race and Cape Ray being the points of the triangle. Within the triangle appears the Maltese Cross, with the junction of four spears forming eight points, symbolically representing the eight Beatitudes, which members are taught to learn and observe. The motto adopted for the Society was Love, Purity and Fidelity, represented by the colours red, white and blue respectively. The Heart's Content Fisherman's Society began to expand its membership outside the community and into other outports on the south side of Trinity Bay. The expansion of the society was reflected in the association becoming the Society of United Fishermen (SUF) in 1873. The SUF is the only fraternal organisation of its kind to have its roots in Newfoundland. By the 1920s, the society was firmly established in many areas of Newfoundland and was expanding into Nova Scotia. In 1928, the SUF extended its membership when they formed the first Ladies Auxiliary in St. John's. Slowly, other branches began to develop auxiliary branches as well. The fraternal organisation provided fellowship and established a mutual support system for its members at a time when there were few services available to fishermen and their families. The SUF Lodge in Heart's Content has served the needs of the association and the community since its construction. It has been used as a circuit court, and it continues to be used for community events such as baby and wedding showers and public gatherings. There have been many changes to the lodge in Heart's Content over the years. The gabled roof was replaced with a mansard roof, the original windows were replaced, the doors moved, the ceiling lowered, and the bread loft closed. The building has also had other renovations associated with the modernization of old buildings, such as the addition of light fixtures and a furnace room. Despite these changes the structure has retained its historical significance and character, and became a Registered Heritage Structure in September 1993. A subsequent $10,000 restoration grant in conjunction with volunteer labour, restored the windows to their original shape and placed the door into its original position. The mansard roof remained, but with a new set of shingles. The SUF Lodge also received a Manning Award from the Newfoundland Historic Parks Association. Also view the Society of United Fishermen Lodge SUF #1 Registered Heritage Structure on the Heritage Foundation of Newfoundland and Labrador web site. The Newfoundland and Labrador Heritage Web Site has on its site only a portion of the registered heritage structures in Newfoundland and Labrador. To view a complete list or search for a particular structure visit the Heritage Foundation's Property Search page.